As a special offer to those of you who attended A Bridal Show to Remember, we are offering 15% off any services booked before March 31st! You can contact us at 407.926.4103 or fill out our contact form and we’ll get right back to you. We would like to congratulate Lauren Pritchard, the winner of our contest to rename our planning packages! The package names she submitted are Petite, Demi, Grande and Luxe, which we feel are a perfect representation of Anna Christine Events. Lauren will be receiving a gift certificate for $100 off the planning package of her choice. Thank you, Lauren! Thank you from Anna Christine Events! 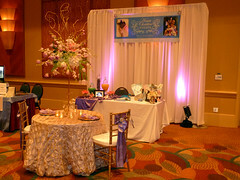 Thank you for visiting our booth at the Central Florida Bridal Association Bridal Show! Thank you for taking the time to visit Anna Christine Events this past Sunday during the Central Florida Bridal Association’s Bridal Show to Remember. We hope you had a great time collecting beads, meeting all the vendors and watching the fashion show! As you are planning the details for your wedding, keep in mind that Anna Christine Events is available to assist you! Whether you are looking for complete event management, design assistance or day-of coordination, we have options to fit each bride’s budget and needs. And, as a special offer to you for attending the show, we are offering 15% off any services booked before March 31st! Please don’t hesitate to give us a call at (407) 926-4103 or fill out the contact form on our website to set up a complimentary consultation and learn how we can help plan your event to perfection! A Bridal Show to Remember! We at Anna Christine Events are very excited and honored to be a part of A Bridal Show to Remember sponsored by Central Florida Bridal Association. Proceeds to benefit Brides Against Breast Cancer and the Making Memories Foundation. This will be an intimate affair with a limited number of brides and vendors in order to allow us to spend more time with you and give you our undivided attention. And being that it’s February, our show is going to be Mardi Gras-themed so come out and party with us this Sunday. Lots of giveaways and door prizes also! 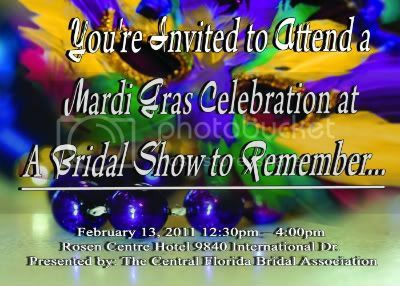 A Bridal Show to Remember will take place on February 13, 2011 at The Rosen Centre on International Drive from 12:30 p.m. to 4:00 p.m. For more information, visit their site at http://www.cfbridal.net/ or call 407-240-7151.